The shop that sells farm animals in Clover Town is run by Mint and her little brother, Nick. They will not be open immediately at the beginning of the game, but after a few days you'll see an event where Vaughn drops off a homeless cow to their shop. After the event, you can buy animals from them. You can only buy 1 of each type of animal to live on your farm. 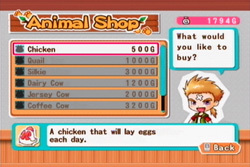 The poultry animals lay eggs that are used in the Egg Decoration Stand, and the cows produce milk for the Ice Cream Stand. Taking care of the animals is easy. If the weather is sunny or cloudy, they will be outside in the pasture. You will have to feed the poultry, but the cows will graze on the outside grass. If the weather is rainy, then all of the animals will be inside their barns and you will have to feed each one. If you do not take care of an animal, it will run away back to the Animal Shop. You just have to buy it again if you want the animal back on your farm. The Turkey and Strawberry Cow are available only if you purchase the add-on packages.